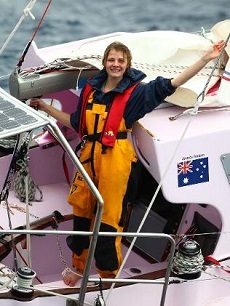 Today, 15 May, is three years since Jessica stopped the nation when she sailed back into Sydney Harbour aboard Ella’s Pink Lady, to become the youngest person to circumnavigate the globe, non-stop and unassisted. Those who were there or witnessed it on television, will never forget this epic homecoming, which was later voted as Australia’s Favourite Event of 2010. An estimated 100,000 spectators gathered around Sydney Harbour to welcome Jessica home. And it was chaos on the water with 1,600 vessels there to greet her plus millions of viewers tuning in to the live broadcasts in Australia, many of whom shed a tear as she crossed the finish line. “It was such a special day and one that I will never forget,” said Jessica today. On 15 May 2010, Jessica really did prove anything is possible and she has become an inspiration to us all.